Kalank Full Movie in HD Leaked on 123movierulz for Free Download & Watch Online: Varun Dhawan-Alia Bhatt’s Film in Deep Trouble Due to Online Piracy! Ajay Devgn Responds To Tanushree Dutta's Question On Alok Nath's Inclusion In 'De De Pyaar De'; Read The Detailed Statement Here! KXIP vs SRH Head-to-Head Record: Ahead of IPL 2019 Clash, Here Are Match Results of Last 5 Kings XI Punjab vs Sunrisers Hyderabad Encounters! Sunrisers Hyderabad (SRH) hit an unexpected roadblock against Mumbai Indians (MI) where they were undone by the brilliance of Alzarri Joseph in VIVO Indian Premier League (IPL) 2019 Match 19. It was also the first low point of the season for Hyderabad who have otherwise dished out some classic performances. But they are overly dependent on their openers to provide them with the right platform to succeed. They travel to Chandigarh next to take on Kings XI Punjab (KXIP) who have done well despite having a very average squad. In terms of KXIP vs SRH head-to-head record, the two teams have played 12 times against each other with SRH dominating with nine wins while KXIP winning the remaining three games. A quick look at how their last five games unfolded. 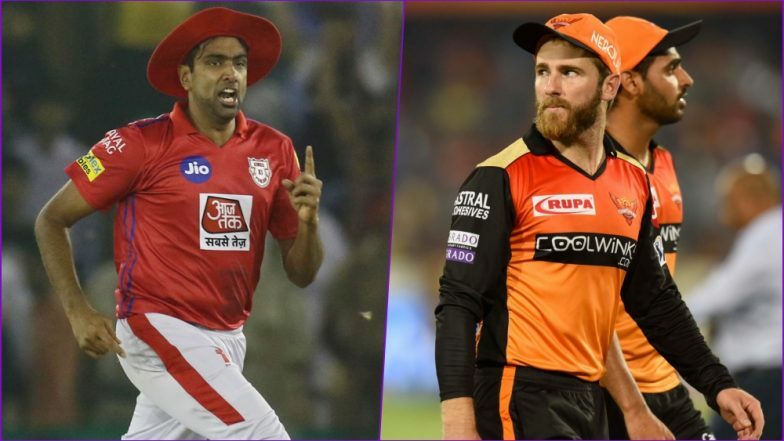 KXIP vs SRH, IPL 2019 Match 22 Preview: Kings XI Punjab, Sunrisers Hyderabad Look to Get Back to Winning Ways. Ankit Rajpoot grabbed a fifer for Kings 11 Punjab on enemy territory restricting Hyderabad to 132/6 in twenty overs. SRH could have been in a worse situation had it not been for a brilliant fifty by Manish Pandey. A target of 133 is considered easy in T20 cricket, but Punjab were all-out for 119 with Rashid Khan at his destructive best snapping 3 wickets. When the Universe Boss is in full flow, there is little room for bowlers to have any breathing space. Chris Gayle tormented the Hyderabad attack from start to finish hitting an unbeaten 63 ball 104 as Punjab put 193/3 on board. In reply, Hyderabad did try and make a contest with the fifties from Manish Pandey and Kane Williamson but fell short of 15 runs ultimately. Kings XI Punjab vs Sunrisers Hyderabad Live Cricket Score 22th T20 Match. The Hyderabad front three did the bulk of scoring in their total of 207/3 with the fifties from David Warner, Shikhar Dhawan and Kane Williamson. The Punjab batting did not get the start they were hoping for losing three wickets for 42. But Shaun Marsh tried to revive his team’s dwindling fortunes with a well made 84, but that was not enough. A close game which Hyderabad won thanks to some brilliant bowling by Bhuvneshwar Kumar who picked up five wickets. In response to Hyderabad’s 159/6, Punjab showed little composure with the bat up top, but Manan Vohra looked like he could pull off a magical win with a solid 95. But with his wicket, Punjab crumbled losing the game by 5 runs. An unlucky Hashim Amla missed out on a century as his 96 helped propel Punjab to 179/4 batting first. SRH chased down the target of 180 with ease as Punjab bowlers failed to apply any kind of pressure on the opposition. Yuvraj Singh and Ben Cutting unleased some power hitting, in the end, to take Hyderabad to a 7-wicket win. SRH will love to get back to winning ways once again, and an unfancied KXIP side provides the perfect opportunity for the visitors to get the two points.